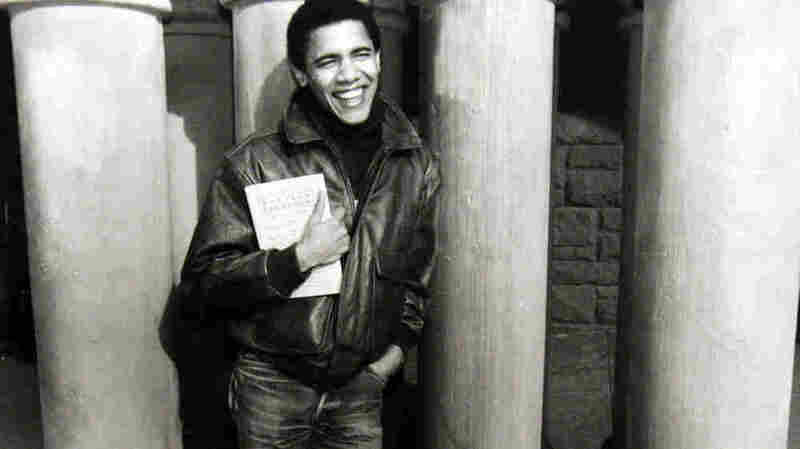 Obama Made A Strong First Impression At Harvard After their first meeting in 1989, legendary law professor Laurence Tribe was so impressed with the skinny first-year law student in jeans, a sweatshirt and an afro, that he made a special notation on his calendar. The student, Barack Obama, went on to become the first black president of the Harvard Law Review. President Obama and GOP presidential candidate Mitt Romney's lives coincide in a number of ways. From now until November, President Obama and GOP presidential candidate Mitt Romney will emphasize their differences. But the two men's lives actually coincide in a striking number of ways. In this installment of NPR's "Parallel Lives" series, a look at Obama's time at their shared alma mater. Harvard professor Laurence Tribe is a sort of legal rock star, particularly among liberals. First-year law students he has never met don't just show up at his door saying, "I want to work for you." At least they didn't until March 31, 1989. Tribe recently retrieved his daily calendar from that year and pointed to the entry for the last day in March. Just above reminders for "Haircut?" 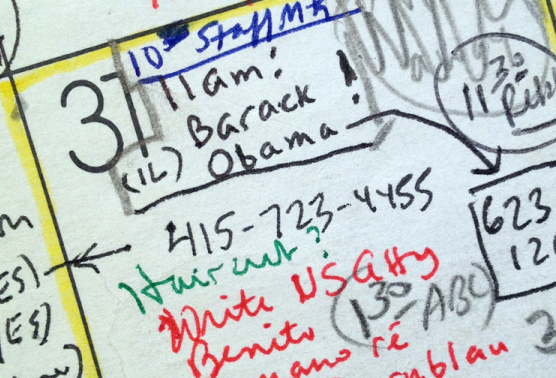 and "Write US Atty," it says, "11 am: Barack Obama (1L)," indicating that this was a first-year law student. 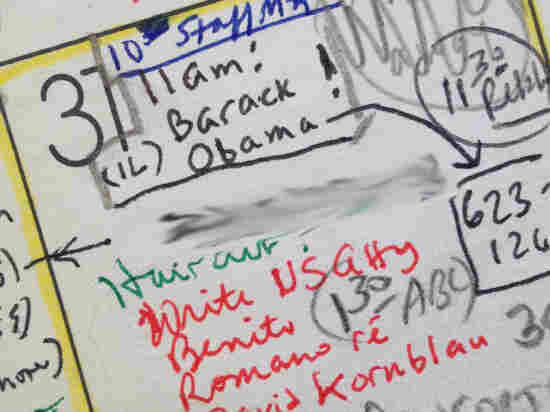 Harvard professor Laurence Tribe's calendar for March 31, 1989, marks his first meeting with future President Barack Obama. The exclamation point was to remind Tribe how impressed he was with the first-year law student. "And then it has a phone number, which I guess is his dorm room," Tribe pointed out, "and there's an exclamation point next to it." That was to remind Tribe how impressed he was by this skinny kid in jeans, a sweatshirt and an afro. Obama's Harvard Law School education set him on a path to national prominence. And although likely Republican presidential nominee Mitt Romney sometimes attacks Obama for having "spent too much time at Harvard," the school is one thing the men have in common. Obama arrived on the law school campus 20 years after Romney earned a joint degree from the law school and the business school. Like Romney, Obama was older than the typical student. While Romney spent time as a Mormon missionary in France before Harvard, Obama worked as a community organizer in Chicago. When Obama arrived on campus, Tribe says it was clear that "he wanted to make a difference. He wanted to learn how the system worked." Their first conversation lasted hours, and Obama went on to work for Tribe on articles and books, including one called Abortion: The Clash of Absolutes. Tribe recalls that his research assistant tried to find a way out of deeply entrenched lines of the abortion debate, focusing instead on education and access to birth control. "It's as though he was looking not just for a point in the middle of a spectrum, but for a line that was perpendicular, so that one could get outside the tragic choice." The two have remained close, with Tribe serving as a mentor and informal adviser to the president over the years. Professor Charles Ogletree plays a similar role in Obama's life. In 1989, Ogletree taught a non-credit Saturday course to give first-year students a basic set of skills in law school. Ogletree remembers the student who always arrived on time, sat in the front row, and was professorial almost to a fault. After answering the question, Obama would say, "But Al, who talked earlier, had a very good point when he said X. And Sarah, I think she really captured it when she said Y. And if you think about Latoya, her analysis was ..." at which point Ogletree would interject, "Barack, I'm teaching this class, not you!" He seemed to know who he was, be very grounded. That might sound like the arrogance Obama is sometimes accused of, but to Ogletree it sounded like this student was trying to bring everyone into the conversation. Even then, classmate Ken Mack recalls, Obama stood apart. Mack is now a professor at Harvard Law School and author of the book Representing the Race: The Creation of the Civil Rights Lawyer. "He seemed to know who he was, be very grounded," says Mack. There was no sign of the kid people used to call "Barry." "If you would've told me that someone had called him Barry, I would have been surprised. Barry is a little bit diminutive — that would not have fit him at all," Mack says. After class on the basketball court, a whole different personality emerged. The conciliating bridge-builder was replaced by the trash-talker with a left-handed jump shot. Obama played every chance he could get, including on the black law students' association team. One day the team agreed to play Walpole prison. Obama was the starting center, standing face to face with his much bigger opponent. "And so Barack started the game by the usual embracing, good luck, what are you in here for?" says Ogletree. The inmate replied, "Double murder." "Barack played no defense at all that game. Didn't shoot any of his traditional jump shots," says Ogletree, laughing. "That's the only time that Barack Obama, in my knowledge, didn't talk trash, either then or now, about basketball." By the end of Obama's second year, his academic record and reputation had qualified him to run for one of the most prestigious roles at the law school — president of the Harvard Law Review. The review editors were a partisan, contentious group. Classmate Brad Berenson remembers the guy from Hawaii who floated above the fray. "One of the enduring images I have of him is of a guy in jeans and a leather jacket, Jimmy Dean style, standing out in front of Gannett House smoking a cigarette." Berenson was one of the conservatives, and in a long, contentious election, his group ultimately supported Obama's candidacy. "They did that in part because they had a sense that he was more open-minded and would listen to the conservatives, and would value and accept their contributions in a way that some of the other candidates would not," says Berenson, who worked in the George W. Bush White House and is now a member of Romney's justice advisory committee. 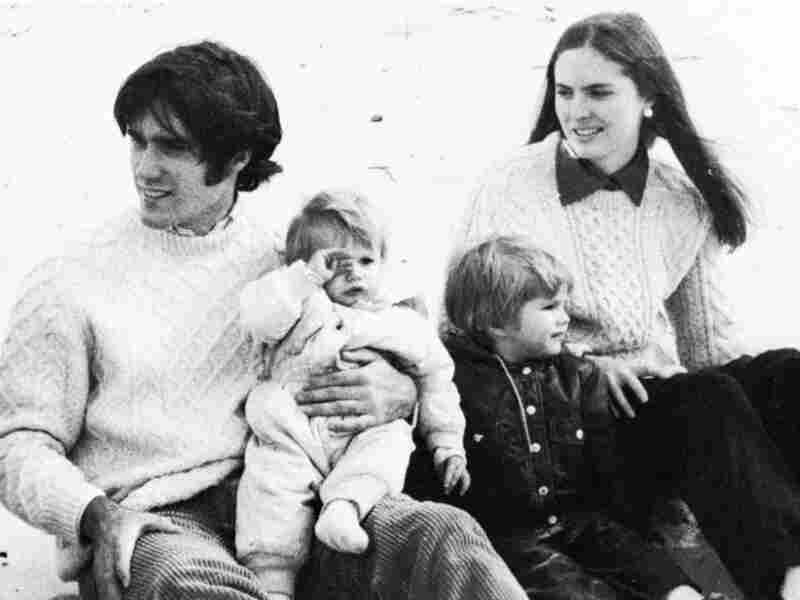 Mitt Romney already had a young family during his time at Harvard — one of several things that set him apart from most students. Find out more about his time at Harvard in another installment of "Parallel Lives." The conservatives' intuition turned out to be correct, says Berenson. "He ended up upsetting many more of his colleagues on the far left than those of us who were on the right, in part because the bottom line for him as president of the law review always remained putting out a first-class publication." Being the first black president of the Harvard Law Review had perks. Obama received national media attention and a book deal. By the time he was ready to leave Cambridge, Mass., every door was open to him. Mack, Obama's classmate, remembers walking back from Harvard Square getting a bite to eat with his friend. "Everyone knew he could clerk for the Supreme Court, get a high-paying law firm job, at least make a lot of money for a couple of years before he went off and did something else," Mack says. "And he said that he had decided that he wasn't going to clerk, and he wanted to go back to Chicago and just get started in the work that he wanted to do with his life." In Chicago, the newly minted lawyer with a Harvard degree returned to community organizing work, and eventually a political career. Ogletree never imagined that his student would become the first African-American in the Oval Office. "My assessment was ... that he was going to be the best damn mayor that we've ever seen in history." Obama recently joked about that assessment with his old friend and mentor, asking, "Man, why did you downgrade me?" Ogletree replied: "It wasn't a downgrade. It was an honest grade." In a previous part of the "Parallel Lives" series, Ari Shapiro explored Mitt Romney's years at Harvard.